Leading Two Private Telecom Operators in India Airtel and Idea Cellular has hiked International calling rates across India after increasing of Data tariff. 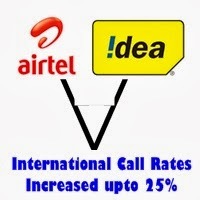 This month due to gradual depreciation in rupee Airtel has increase International calling rates upto 80 per cent and Idea Cellular hiked International call rates upto 25 per cent based on company official website. Countries like USA, UK and Canada International Call rates increased to Rs.8 per minute from Rs.6.40 per minute earlier by both telecom companies. The calls for dialing Australia numbers with ISD code 6113 and 6114 has been raised from Rs.100 to Rs.180 which is 80 per cent extra on Airtel Network. Recently Three major Telecom players Hiked Data Tariff.